GUCCI TIFOSA MINI-LEATHER TOTE $1785. Inspired by the 1950s-style paneled soccer ball, the Gucci Tifosa tote is the ultimate sports-luxe piece. Compact but spacious, this statement bag is rendered in a dark red, and complemented with golden hardware and retro GG emblem. COTTON CITIZEN MILAN SWEATPANTS $195. Cotton Citizen are fast become everyone’s favorite sweatpants. These ultra soft fleece sweats feature classic athletic detailing with an ankle zip for a sporty look you can work with a heel or a sneaker! BOTTEGA VENETA KNOT INTRECCIATO LEATHER BRACELET $280. Offered in vivid red, Bottega Veneta’s Knot bracelet incorporates the iconic intrecciato weaving technique and signature knot of the brand. Made in Italy from soft lamb leather, a shiny silver-toned charm engraved with the logo finishes the piece. VAARA NAOMI STRIPED STRETCH SPORTBRA $120. Designed for medium-impact support, this fun and playful sportbra features a breathable, lightweight stretch fabric with elasticated underband that flexes as you do during workouts. Pair with matching leggings! CENTER: MONCLER SKI SUNGLASSES $220. 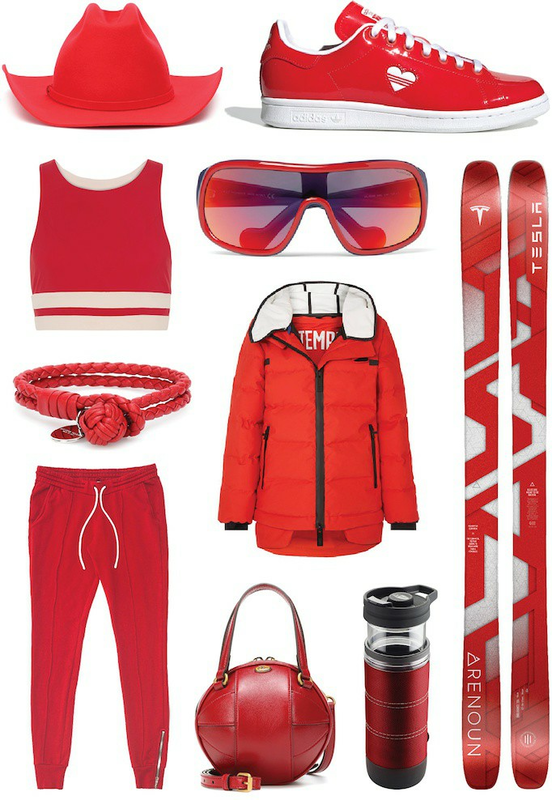 Style and performance collide in these signature ski glasses from Moncler in navy and red shades. Crafted from durable acetate, large frame reflective lenses minimize glare on the slopes with 100% UV protection. TEMPLA 3L HOODED QUILTED DOWN JACKET $1980. This quilted snow jacket takes it style and functionality from the slopes and brings it to the street. A new fashionista favorite, Templa’s 3L style is made with a waterproof red shell that’s pumped full of cozy down and fitted with sealed zips for extra warmth and protection.